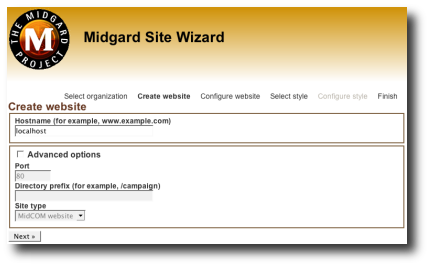 The site wizard is being built in MidCOM CVS HEAD, component midgard.admin.sitewizard. Currently the component loads correctly, and lists all regular (non-admin and non-attachment server) Midgard websites in its navigation array. The first form in the wizard, "Select organization" has also been implemented but is so far non-functional. As the Site Wizard operates as a regular MidCOM component, it enjoys all the regular benefits like configuration, localization and templating. This will enable hosting companies to deploy the site wizard using their own branding and terminology.